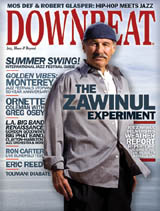 The May issue of Down Beat magazine has a nice cover story on Joe by long-time writer Josef Woodard. Brown Street is the focus, but Joe touches on a lot of subjects. The issue comes nearly 30 years after Joe’s first Down Beat cover story in 1978 during the heyday of Weather Report.